Related to that ^ is the "SAMR Flowchart,"
both of them from Blue Valley Educational Technology. "SAMR Model Visually Explained for Teachers"
"SAMR and Bloom's Taxonomy: Assembling the Puzzle"
"8 Examples of Transforming Lessons Through the SAMR Cycle"
"10 Ways to Reach SAMR's Redefinition Level"
"A SAMR Deep Dive: Deconstructing SAMR with Examples"
Here is the Prezi presentation from September 21, 2016, delivered for teachers at Berg Elementary School and Hagen Junior High School. ​To enlarge, click "Start Prezi" and then navigate to the lower right corner of it and click the "Fullscreen" button. The swimming pool graphic is from Jaclyn Bell (click the "Full Screen" button in the lower right corner to enlarge). ​Click here for her quick explanation of SAMR; and click here for more of her resources related to SAMR. 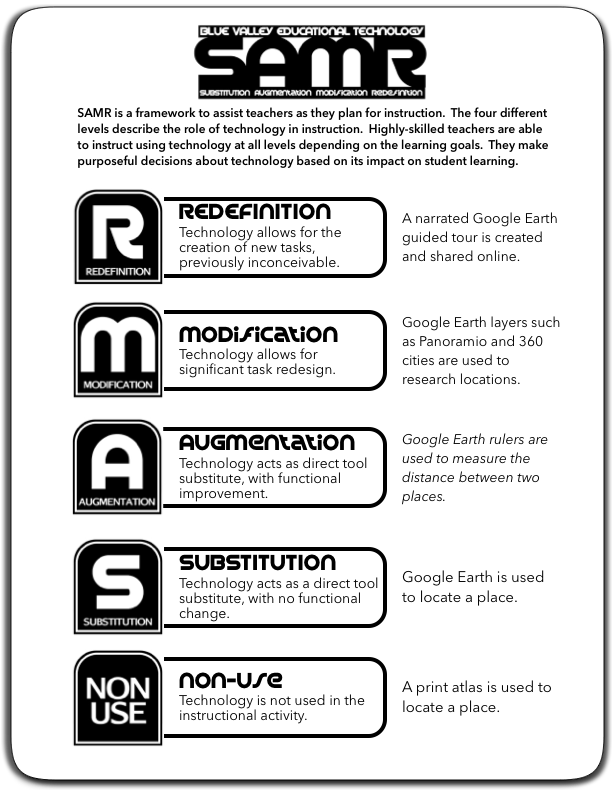 Looking for a different metaphor (other than a ladder or a swimming pool) for the SAMR levels of technology integration? Check out this one: coffee making!